This was the rare Mixology Monday where I knew almost immediately what I would select. I think the greatest introductory cocktail must be the simple, elegant, and oft-abused daiquiri. Shake with ice until good and cold. Double strain into cocktail glass and garnish with lime. I think of the daiquiri as an excellent “First Time” drink for a few reasons. It’s easy to make, it’s easy to drink, it’s easy to play with, and it’s a great introduction to the world of cocktail geekery. It may come as a surprise to some, given my propensity to wax poetic about gin and whisky, but the single cocktail I make most frequently at home is the daiquiri. Squeeze a lime, pull out the simple syrup, pick the rum, give a good dozen shakes, and I have a delicious drink. Even better, it’s easy to always make at least a decent daiquiri. As long as you start with a decent rum, freshly squeezed lime juice, and simple syrup, and you pay attention to your pour, you’ll have a tasty libation. Limes too tart this time? Add a little more simple syrup. Too sweet? use that garnish to add some extra sour. One of the things I love about the daiquiri is the way it lets you play with it. I like mine on the sweet side, and so I usually go for the 4:2:1 rum:simple syrup:lime juice combination. The next most common variation is to reduce the simple to 1.5 or 1 parts, when I want to punch up the lime. I use the daiquiri as my exploratory drink for most rums, even though the drink traditionally calls for a light (and preferably Cuban-style) rum. My favorite at the moment is Flor de Caña Extra Dry, but that’s a special order here in Washington, so I don’t always have it on hand. I also enjoy it with Cruzan’s light rum as well as Appleton’s. And I also enjoy the same recipe made with a darker rum. Bring on the Pusser’s, Appleton Estate, or Bacardi 8 años, and I’ll mix it with lime and sugar and be happy as can be. Getting a little bored with our original ingredients? Try some vanilla simple syrup or ginger syrup instead. Out of limes? Use lemons, and you’ll have a drinkable variation. Of course, part of the fun of having a cocktail blog is holding forth on issues like the real origins of drinks and how they’re so abused today. 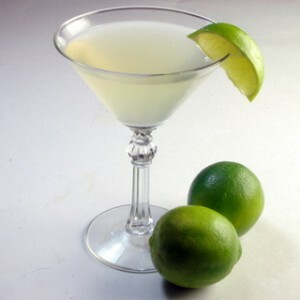 The daiquiri is a classic example. There are multiple stories of how the daiquiri got its name, but adding lime and sugar to rum is about as old as rum itself. This rum drink also presents plenty of opportunity to talk about such great drinkers as Hemingway – and provides a gateway to next drinks like the Hemingway daiquiri and the Papa Doble. Do be sure to teach your new drinker the history of the drink. Also prepare them for the slushy disappointments they may receive if they order from a bar that uses premix and blenders. I like to think that if you have the rare chance to introduce someone to cocktails, you should do it right. I like to think of the daiquiri as a great place to start. Thanks, Pink Lady and LUPEC Boston, for a great theme. I look forward to the round up and seeing what everybody else is recommending for the First Time!